So what exactly is the Mega Amp? It is a universal audio amp designed to work in every Genesis ever made with minimal alterations. Put this in any Genesis and you will experience either the sound of a VA0 MegaDrive Model 1 or the full spectrum of the Genesis' sound hardware. 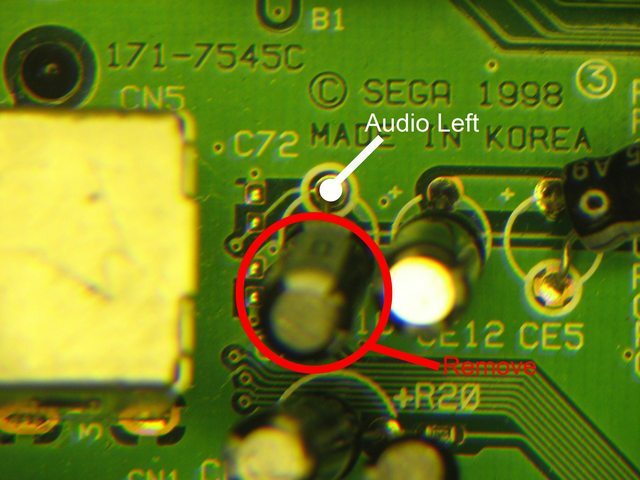 If you remember back in 2012, I posted a replacement audio circuit made specifically for the VA2 and VA2.3 Genesis Model 2s, of which only one console exists with this circuit and it's Mexico (no, it's not a Mexican Sega-16 member who has it). I then started working on a universal audio amp for use on GOACs, but now, it has become something bigger. After having been approached by Villahed94 to make something bigger than any of my previous two circuits and with his assistance, the Mega Amp was born. 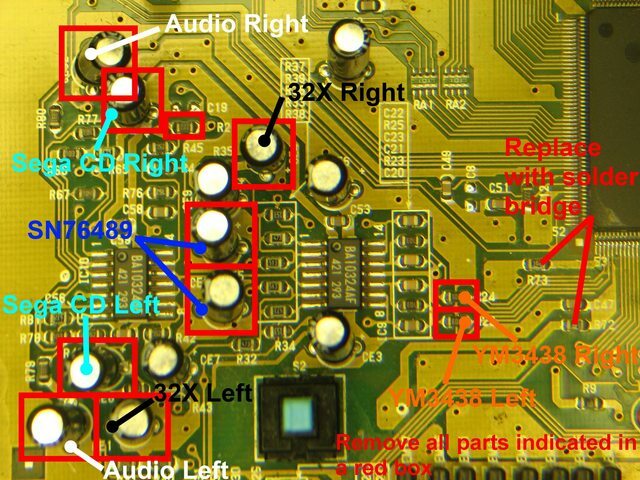 Working off those old circuits, which have become early Mega Amp prototypes, we now have the most complete replacement audio circuit for the Genesis. Three different circuit types are available, which are named "Filtered", "Unfiltered" and "System C-2." Same circuit, different low-pass filter, except for the System C-2 version which has dual filters and extra circuitry added on as a result. 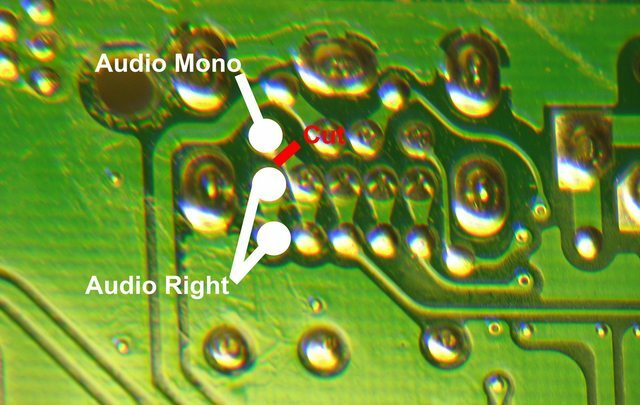 The filtered circuit uses a 3.68KHz low-pass filter to give that sound the Genesis Model 1 is known for while the unfiltered circuit uses a 21.16KHz cutoff frequency to get the full spectrum of the Genesis' audio hardware. 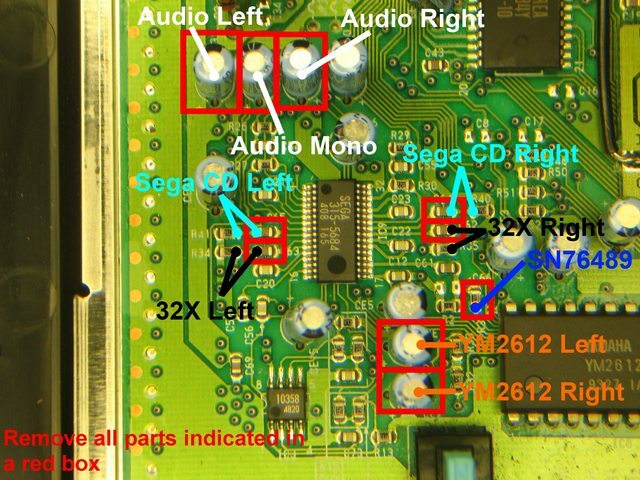 The System C-2 version's dual filters include a 3.39KHz low-pass filter on the FM side of things and a 15.92KHz filter for everything else to bring the sound of the Sega System C-2 arcade board to the Genesis. Currently, the Filtered and Unfiltered Mega Amps are available for all YM2612 and YM3438 variants, but the System C-2 Mega Amp is only available for the ASIC YM3438 and discrete YM3438. 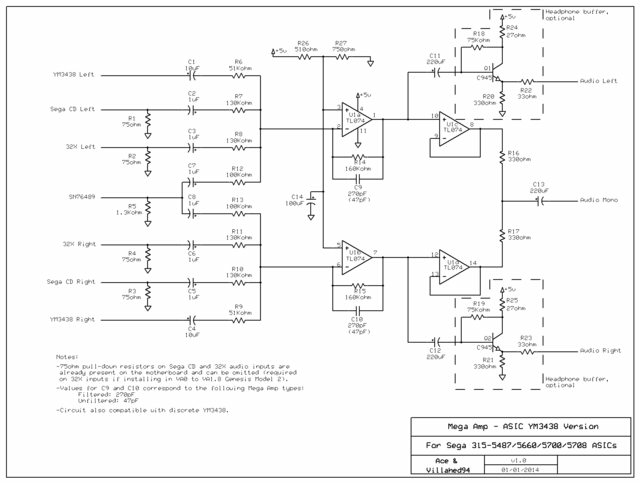 The schematics of each circuit are below. Click on the thumbnails to view the schematics at full size. 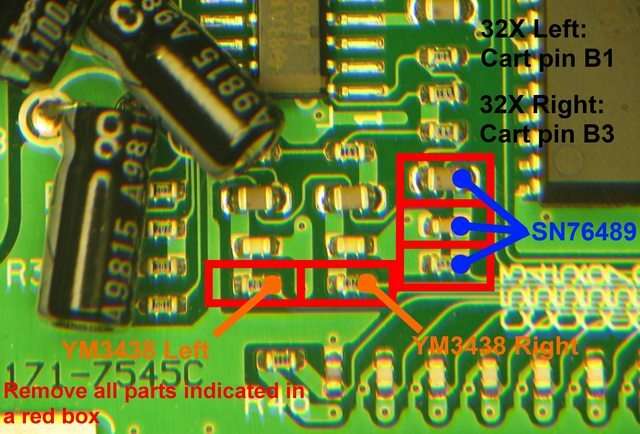 If you would like to build a Mega Amp but don’t have access to a TL074, any quad op-amp (plus an extra dual op-amp for the System C-2 version of the ASIC YM3438 Mega Amp) or two dual op-amps (three for the System C-2 version of the ASIC YM3438 Mega Amp) with at least 3MHz bandwidth will work. The only exception to this is the LF347 which, while having 4MHz bandwidth, outputs horribly mangled audio when used with a 32X. As such, it is HIGHLY suggested to not use this chip. The recommended setup is a single TL074 or two TL072s. Installation diagrams for GOAC-based Geniclones will be provided on the post below and diagrams for the CDX and Nomad will be added to this post at a later date. NOTE: There is some excess noise in this setup. This particular Genesis was the subject of a failed Neptune mod, so it behaves in a weird way. Word of note about Sample Sets 7 and 8: the Genesis used has a strange habit of dropping notes in some of Thunder Force III's music. It also does this with a YM2612. Once Villahed and I get some PCB designs made for the Mega Amp, there will be two pre-modded Geneses in the Sonic's Bazaar section of the site which will each have the filtered and unfiltered Mega Amps, the first systems to receive completed Mega Amps. When the consoles are ready, I will link to the thread. The Mega Mixer is here! This variant of the Mega Amp is designed for use on the TCT-6801 GOAC and has no amp, hence the name change to Mega Mixer. This takes advantage of the TCT-6801's on-board headphone amps to deliver the sound of the Mega Amp in the simplest way possible. 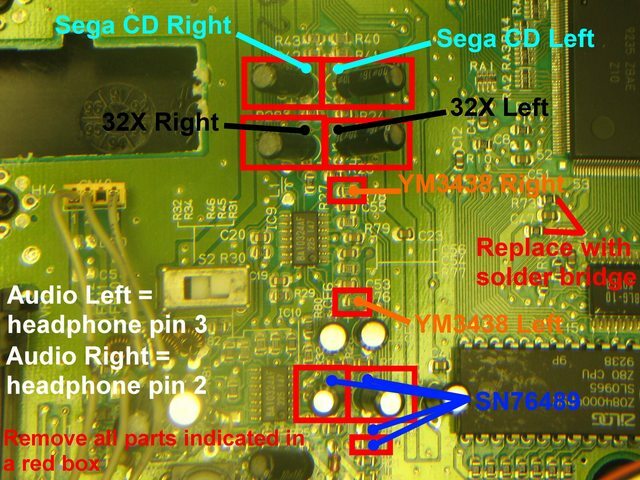 Post updated on June 24, 2014 to add the System C-2 version of the ASIC YM3438 Mega Amp, include a simplified circuit for the GOAC YM3438 Mega Amp, include both the unfiltered and filtered Mega Amp variants for each chip on the same schematic and reuploaded all pictures to Imgur. Post updated on July 6, 2014 to add a few audio samples from some of Sega's stock audio amps. 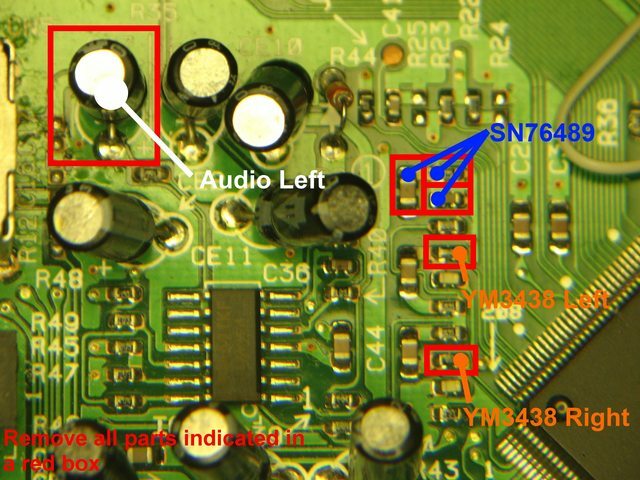 Post updated on July 28, 2014 to show more clearly what parts make up the headphone buffers so there is less confusion as to what parts need to be omitted if a headphone buffer is not installed. Last edited by Ace; 07-28-2014 at 05:22 PM. 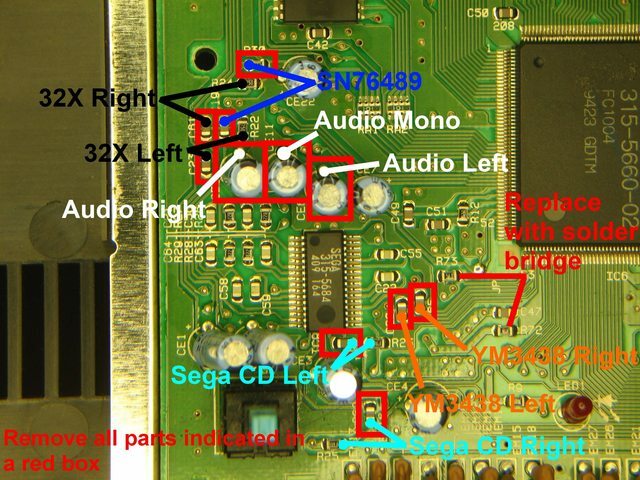 Which version should I use for my discrete YM3438 modded system? Customized Sega Genesis Model 1 - VA3. Energy efficient with buck converters instead of LM7805's. Discrete YM3438, if you want model 1 like filtering use the filtered version. We're sure it'll sound perfect and distortion free. 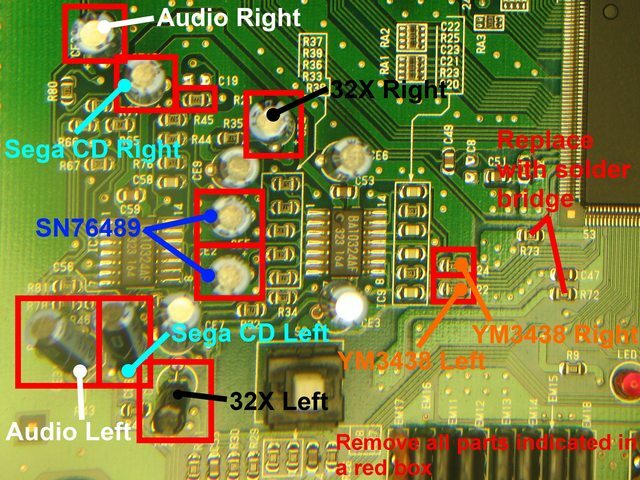 Mega Amp: The reference audio circuit for the Sega Genesis/Mega Drive. Actually, it's ASIC YM3438. 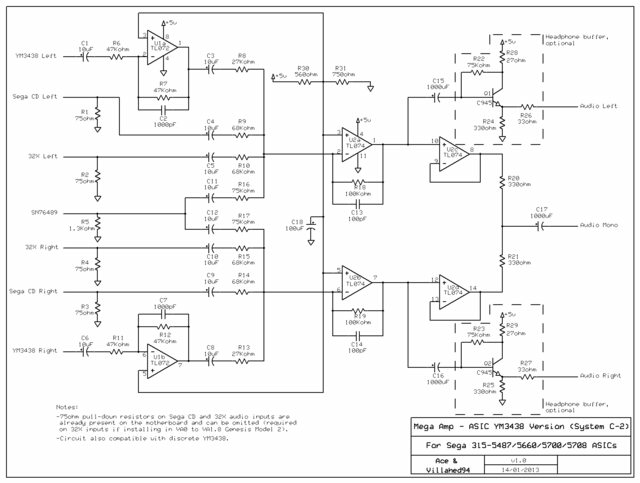 Those circuits work on both the ASIC YM3438 and the discrete YM3438. Perhaps Villa Head Ninety-Four will mod my VA7 for free if i threaten to send him AES games in the mail. Last edited by Moirai; 01-02-2014 at 12:07 AM. 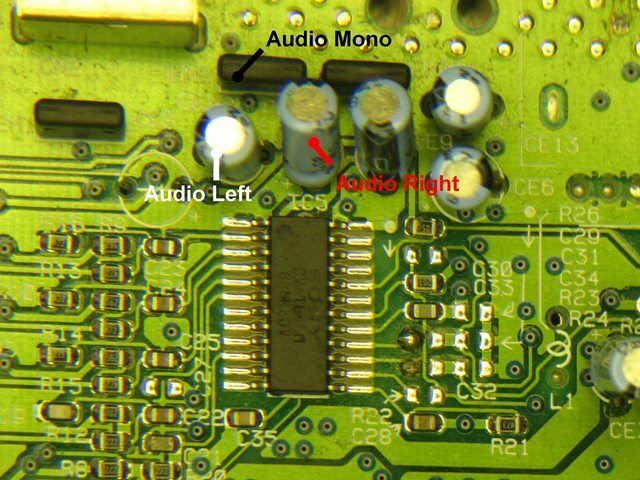 The OP mentions that this circuit replicates the VA0 - VA2 model 1 sound. Is my VA5 model 1 somehow inferior to those boards? I thought all model 1s had the same sound excluding VA7. 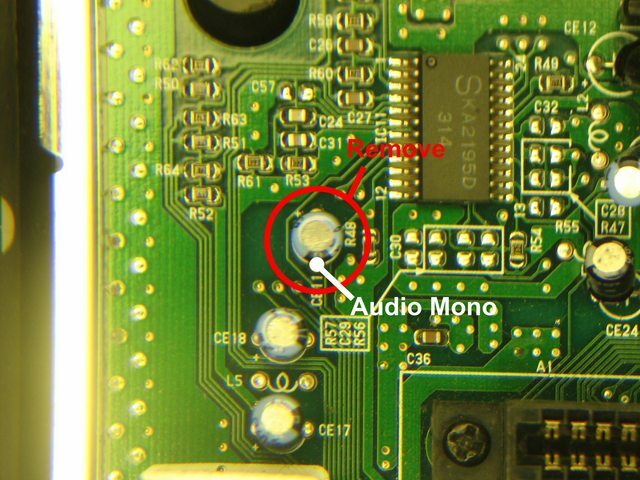 The filters are slightly weaker on the VA0 to VA2 boards, but those have excess gain on the pre-amp which causes distortion. The filtered Mega Amp brings the lighter low-pass filtering of the VA0 to VA2 Model 1 boards with the corrected gain of the VA3 to VA6.8 Model 1 boards. The best of both worlds. I guess the idea Ace is going for is to give everyone a Genesis which sounds like the original, the one and only VA0 Mega Drive, released in 1988. 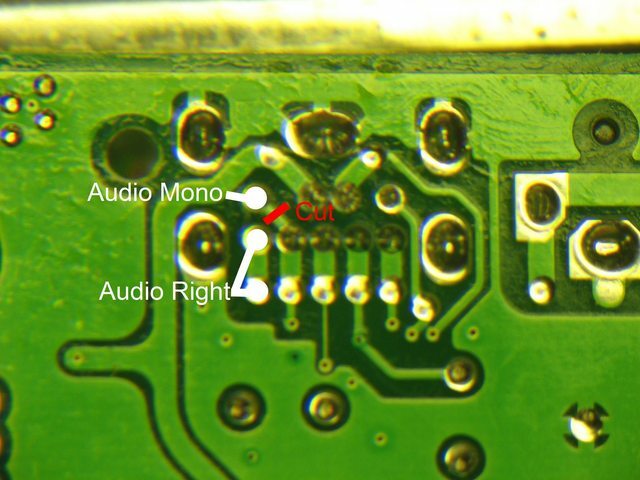 How does this compare to the Crystal Clear Audio Mod for Model 2's? Even less filtering (CCAM is around 15 khz) and easier to make from scratch. Also lower power consumption. It has a louder output and even without the headphone buffers it can drive headphones quite nicely. Yes! 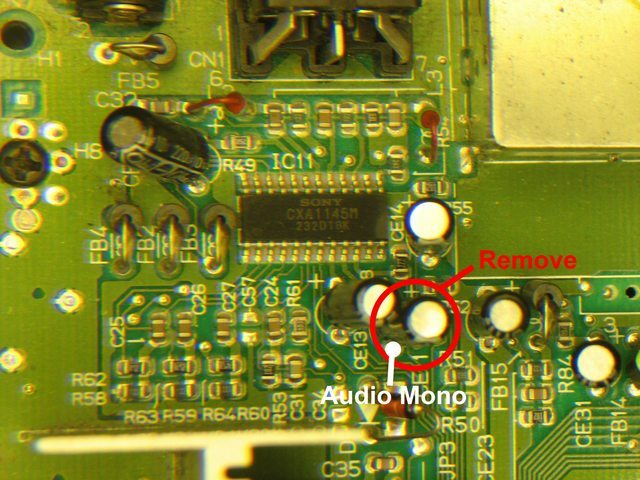 Btw Does the GOAC YM3438 *********** (for x-in-1 clones with GOACs) works with the TCT-6801? Is it the same as the Retron3? 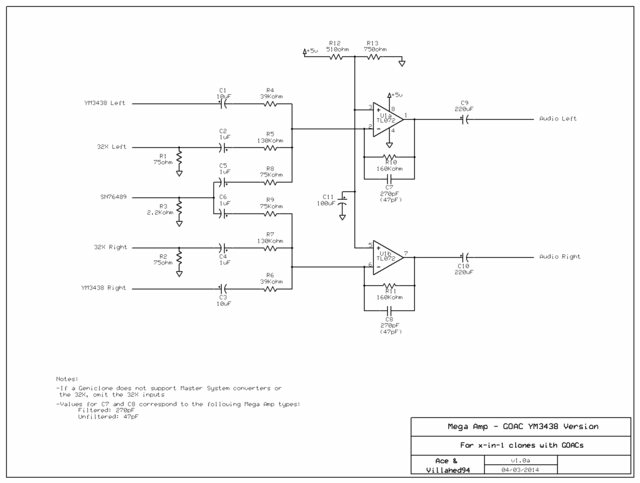 Can i use MC33079D op-amps as i hate the TLxxx series and really don't want to use them? 2. 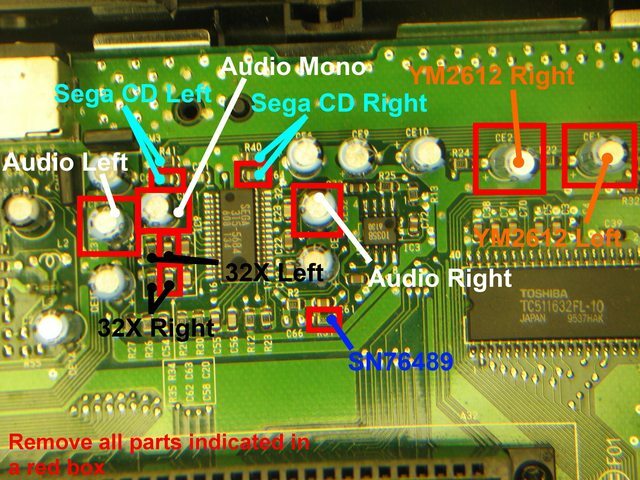 Sega Genesis II VA3 China x5. Video - Sony CXA1145, 1645. 3. Sega Genesis II VA3 Japan x4. 4. Sega Genesis II VA3 Thailand. 5. 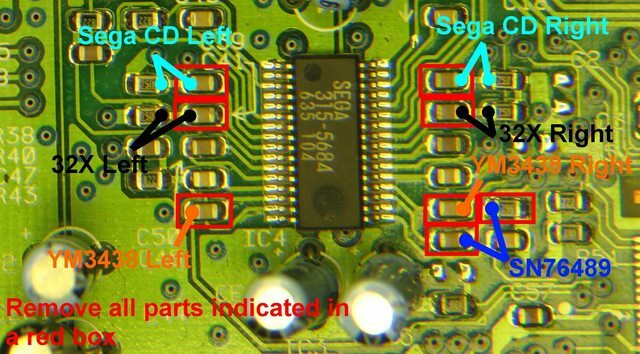 Sega CDX + Infrared Controllers. 5. Sega Saturn Launch Edition Boxed - ( USA ) - Made in Japan. 6. Sega Dreamcast Boxed - ( USA ) - Made in Japan. Sure, there is no problem about that. Yes, it's been tested on systems with that GOAC and it works just fine.